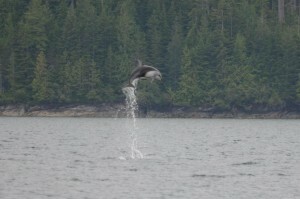 The pacific white-sided dolphins are seen quite often on both the grizzly bear tours and the whale watching safari. 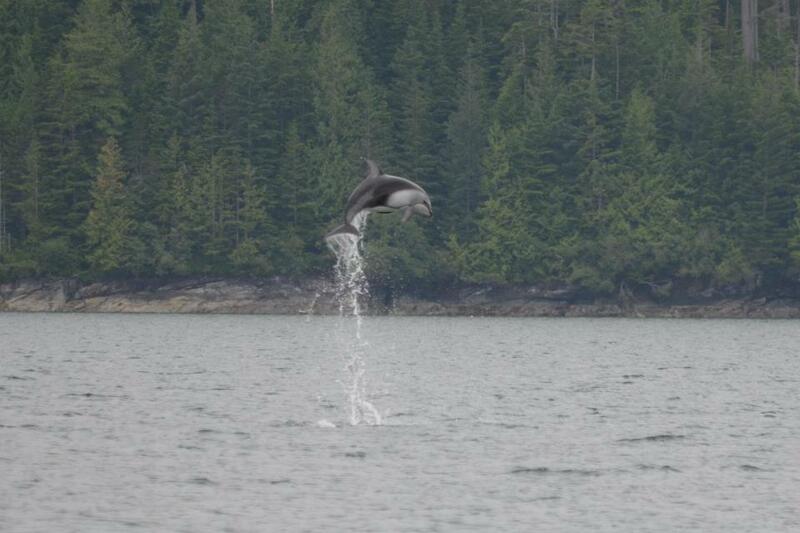 These dolphins are present in First Nation’s middens dating back 2,000 years, but they were rare in B.C. during the 19th and 20th centuries. Starting in the 1980’s, Pacific white-sided dolphins started to become more abundant in inshore waters and inlets along the B.C. coast. It’s possible that their long absence was related to a change in ocean temperatures and a shift in their prey distribution. Dolphins travel in groups throughout their lives. We usually encountered groups of 50 to several 100 animals, although some groups have been seen with 1,000 or more individuals in our viewing area. As the photo demonstrates these dolphins are energetic and quite active and are frequently seen leaping, belly flopping, and somersaulting. They are strong, fast swimmers and enthusiastic bow riders, often staying with moving vessels for extended periods. Great photo of “the one that got away”. Grizzly bear watching from the viewing stands on Knight Inlet’s Glendale River takes place after August 24th. This photo was taken from the finger stand, which overlooks the holding pool where the salmon wait before going into the spawning channel. In this case the grizzly was about seven meters (21 feet) below the stand at the edge of the pool. The water at this point is about a meter and half (4-5 feet) deep and it is really hard to catch a salmon in deep water most of the fishing on this side of the stand is picking up dead or wounded salmon that have drifted into the pool. The other side of the stand is the natural river, which offers better fish but not as easy catching. 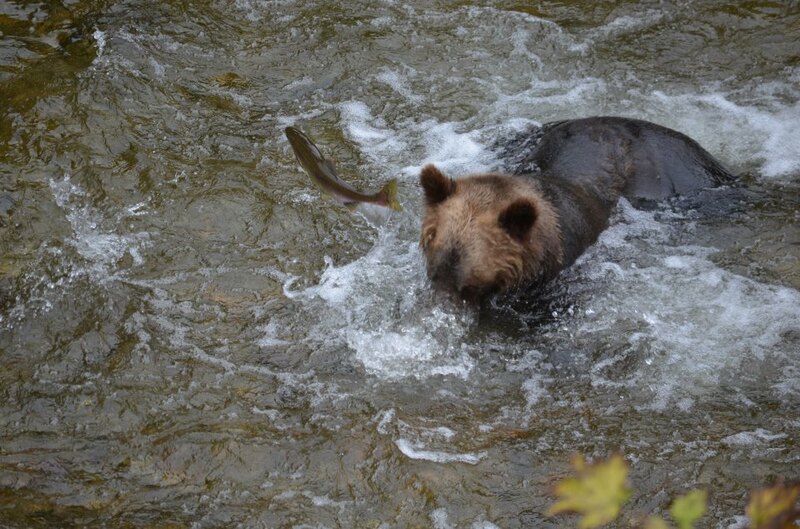 It appears that this bear was trying some river fishing techniques without much success. Perfect photo of a bald eagle landing or taking off either way it is still a great picture. We cannot guarantee “this” photo but there are many eagles in our viewing area. 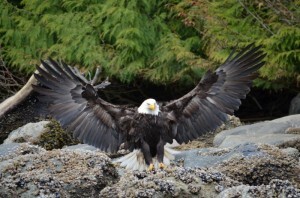 From the eagles in the tree near the lodge’s dock to any number of trees while on a day watching grizzly bears or on a whale watching excursion. Bald eagles are often seen picking small fish or herring from the water, feeding along the shore on recent catches or in the river picking on the salmon left by the grizzly bears. 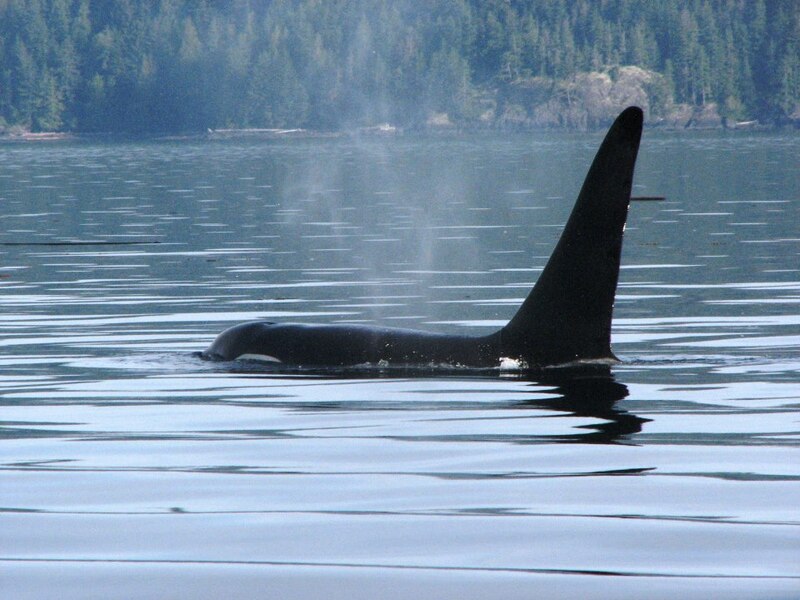 Orcas (killer whales) can be identified on an individual basis due to natural markings and differences in fin shape. Dorsal fins that vary in shape and size often have unique nicks or scars. The saddle patch behind the dorsal fin also varies from in shape, size, color and scarring. 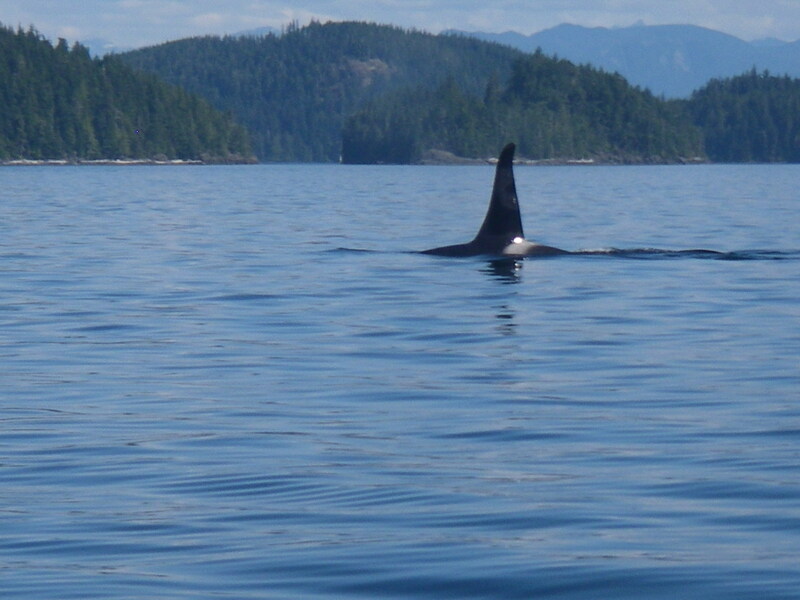 This male orca is a member of the northern resident community, which are most often seen during the summer months in the area of western Johnstone Strait and Queen Charlotte Strait, off northeastern Vancouver Island. This orca watching area adjacent to Grizzly Bear Lodge is also the home of humpback whales, which along with the orca are normally viewed on a daily basis. Spring and early summer (until August 24th) tours from Grizzly Bear Lodge involve a boat ride up Knight Inlet to the estuary of the Glendale River. 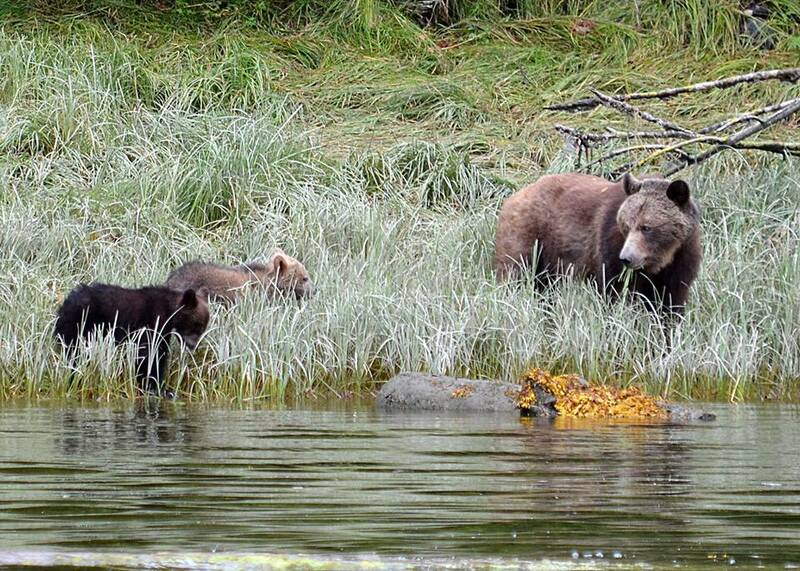 This photo of the grizzly bear with two spring or first year cubs was taken in this estuary. 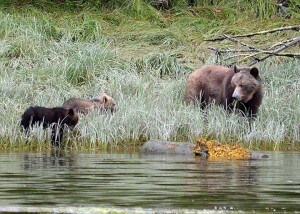 The mothers bring their cubs to the shores along Knight Inlet in late May. The cubs born in January or February are only three or four months old and when they first appear along the shore stay close to their mothers. As time progress they move into the estuary to feed on the protein rich sedge grass. These cubs are closer to five months old but still stay close to their main source of food as they will nurse for a few more months and there will be a few male grizzlies in the area because mating season last until mid-June. This is a great picture of a sub-adult grizzly in BC’s Glendale River estuary in the spring. The long looking legs because of the absence of a fat belly means that sedge grass and protein from turning over rock is this bear’s main food source. Sub-adult or juvenile grizzly bears refer to the age they leave their mother and they reach sexual maturity. 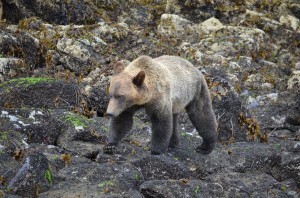 Depending on food abundance mother grizzlies may keep their yearlings a second (even a third) year, denning together again and breaking up in the third (or fourth) year. The average breeding age for female grizzlies is 4.5 years. Males reach sexual maturity at roughly the same age as their female counterparts. Even though males are capable of breeding at three or four years of age, they rarely have the opportunity to do so because of intense competition from older, bigger males. The float plane flight from Campbell River on Vancouver Island means that arrival at Grizzly Bear Lodge is between 3:00 and 4:00. Once guests are settled in their rooms a welcoming snack of fresh dungeness crabs or prawn is served on the front deck. The first evening is a familiarization tour where you get to know your guide and feel comfortable is the boats and start to check off the list of wildlife you hope to see. 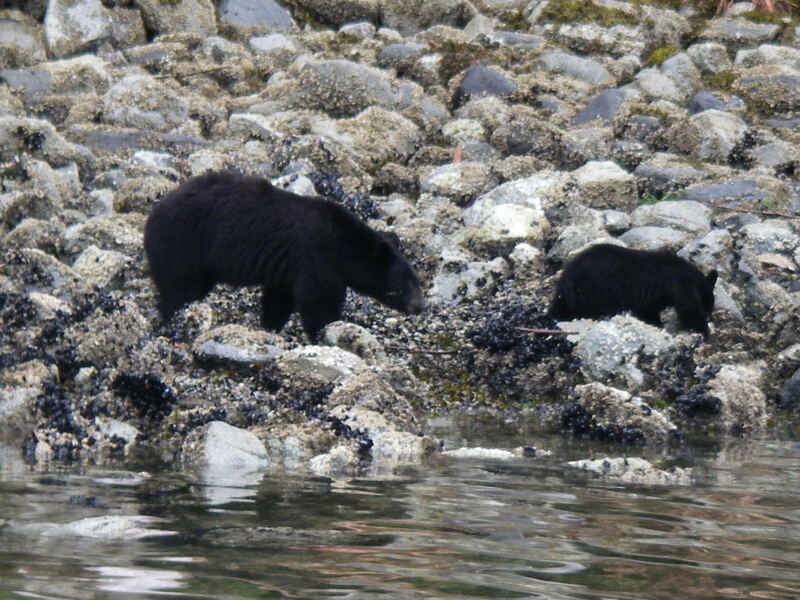 If the tide is right and low enough to have a beach black bears may come to forage. As both the grizzly bear tours and the whale watching safari days are by boat the guides are always looking for black bears. Black bears appear on the beaches to turnover rocks. This inter-tidal zone “food” is high in protein and is made up of crab, clams, barnacles, amphipods and other tiny invertebrates. 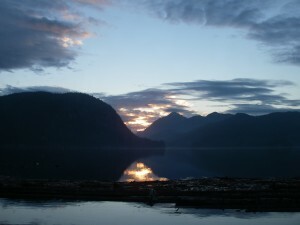 A guide’s view of early morning from the dock at Grizzly Bear Lodge on BC’s Knight Inlet. We are up about an hour before we call guests for breakfast and have often made several trips to the dock and our boats to make sure the picnic lunches are onboard with drinks and ice in the coolers. The boat tops are down, windshields cleaned and the seats dried and ready to leave by 7:30 or 8:00 depending on the season. Every morning in the lodge is a good morning some are just more scenic. 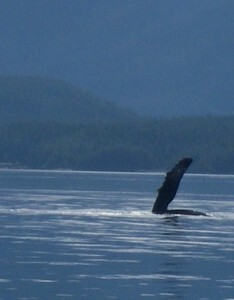 Humpback whales are common in the waters between Vancouver Island and the BC mainland. A normal viewing day from the lodge will encounter more than a dozen whales which often put on dramatic displays of breaching, lobtailing and fluking. In the case of this photo slapping a pectoral fin like a tail. Comparing it to yesterday’s post one can see way from a distance it could be mistaken for an orca. An interesting fact is that the humpback whale’s large pectoral fins have been the inspiration for the development of new aerodynamic technology to help fast-moving helicopters, maintain lift and increase maneuverability. The bumps on the pectoral fins of humpbacks have been used as inspiration before, in the development of turbine blades used in wind turbines, hydroelectric turbines and ventilation fans that increase efficiency. 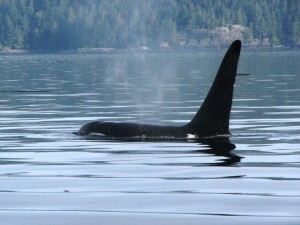 Orca, killer whales or blackfish are all the same and the residents return by late June most years. 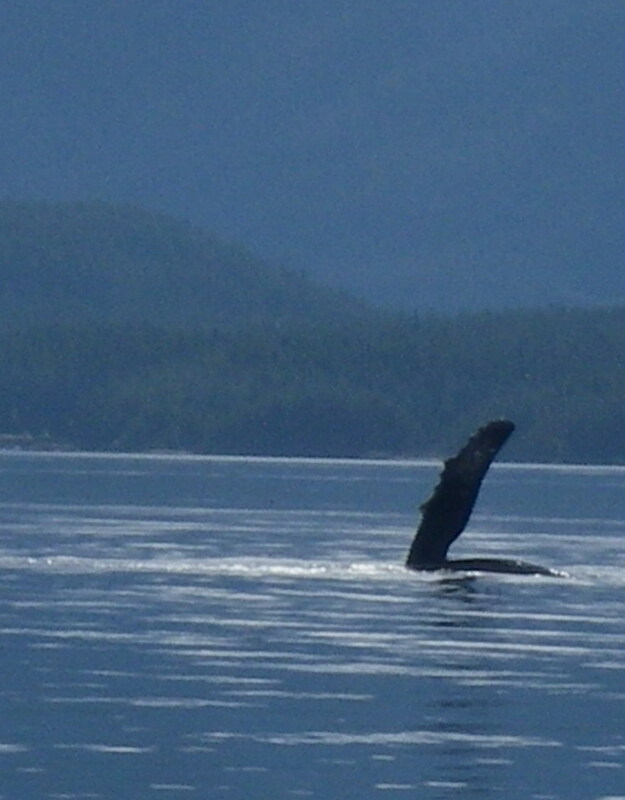 Our whale watching safaris are in the area of Johnstone Strait between Vancouver Island and the British Columbia mainland. 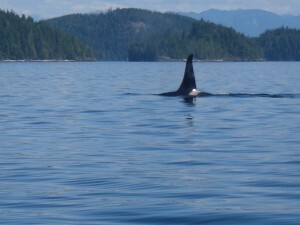 This photo of a male orca shows a mature dorsal fin. Following are some interesting fact about dorsal fins taken from www.seaworld.org/infobooks/killerwhale. 2. The dorsal fin acts as a keel. The dorsal fin probably helps stabilize a killer whale as it swims at high speeds but is not essential to a whale’s stability. 3. The dorsal fins of male killer whales are the tallest of any cetacean in the world, growing up to 1.8 m (6 ft.). Female dorsal fins are smaller at about 0.9 to 1.2 m (3-4 ft.) and may be slightly curved back. 4. For male killer whales, dorsal fin growth is thought to be a secondary sexual characteristic as peak growth of the fin coincides approximately with the onset of sexual maturity. 5. 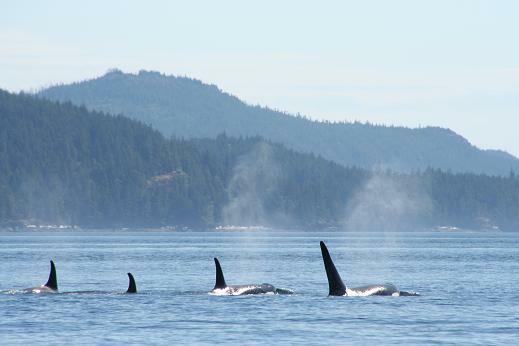 Because of the huge diversity of killer whale dorsal fins and the adjacent saddle patch, researchers take pictures of these fins to identify individuals and their pods, much like fingerprints are taken to identify humans.